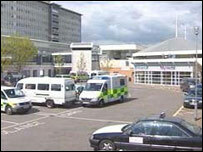 Bed blocking at Wales' biggest hospital is causing "chronic problems" for A&E, Cardiff and Vale NHS Trust has said. It follows an e-mail released by the Welsh Liberal Democrats, allegedly from an A&E doctor, which said patients' lives at Cardiff's University Hospital of Wales were at risk. The trust acknowledged on Friday that there were problems at the unit. But a spokesman said there would not be substantial improvements until the bed blocking was cleared. Trust chief executive Hugh Ross said he was "acutely aware" of problems faced by staff and said more key staff - doctors, nurses and support workers - would be employed over the next three years. The term bed blocking refers to usually elderly patients who remain in hospital after their treatment is complete because there is nowhere suitable for them to go. Because they are taking up the bed, no other patient can be admitted for routine surgery or emergency care, thereby 'blocking' the flow of patients through the hospital. Marcus Longley, associate director of the Institute for Health and Social Care, said the big issue was where patients should be discharged to in order to cut bed-blocking. "We have got a bit of a crisis at the moment in the private nursing home and residential care sector," he added. "For many years, their income has been pegged because the health service won't pay them any more and their costs have been rising." 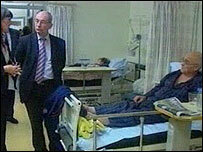 The situation at the capital's hospital was first highlighted by the Liberal Democrats on Thursday. The party released an e-mail purporting to come from an unnamed doctor. It said that hospital staff had "countless anecdotes of instances where patients lives have been put at risk" by the Labour-run Welsh Assembly Government's health policy. It described emergency departments across Wales as being "third world," with patients regularly waiting more than 90 hours on hard trolleys for a bed. The e-mail also claimed that the doctor and nursing staff were reduced to tears by the poor treatment they were forced to give patients because of the situation. The statement from Cardiff and Vale NHS Trust highlighted that all of its workers were "committed to providing the best possible care for our patients", adding that hospital staff "do a good job in extremely difficult circumstances". Mr Ross said the trust's board had approved a £500,000 investment for UHW's emergency unit, which would be funded from savings. He added that other trusts in the area worked together to manage demands on services by taking UHW's patients when its emergency unit has had to close to admissions. Mike German, for the Liberal Democrats, said the e-mail "cannot be swept under the carpet". "It comes to something when you have to have hard-working, professional staff having to send e-mails to people like me to get something done," he added. First Minister Rhodri Morgan has ordered an investigation into the e-mail, although he said it was difficult to measure the validity of its claims because of the anonymity of the sender. "Plaid Cymru accused the Labour administration of creating a "smokescreen to divert attention away from the terrible crisis in the NHS". "New Labour cannot use this to hide the fact that one in ten of the Welsh population are waiting for treatment," the party said. The Welsh Conservatives said the e-mail demonstrated the frustration of doctors and nurses working in the Welsh NHS today. "Rhodri Morgan should be utterly ashamed of the situation he has created," they said.